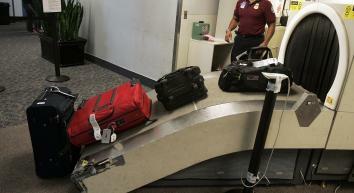 Airport Scanner mobile game helps researchers evaluate real-life TSA screeners. The game Airport Scanner may give clues about real-life screeners. A half-empty water bottle, a bottle of shampoo, a pocketknife keychain—baggage screeners see these items every day. But after spotting so many minor infractions, most of them accidents and nearly none of them a threat to national security, do TSA screeners become desensitized to rarer and more dangerous items? According to data pulled from a popular video game, the answer may be yes. You may already know the game Airport Scanner, a smartphone app that lets you X-ray virtual luggage for contraband. But Airport Scanner is more than a chaotic and endless array of upgrades and high scores. Beneath it all, researchers at Duke University saw a massive data set containing valuable clues as to how visual recognition works. In the game, players become accustomed to flagging luggage that contains anything from the TSA’s prohibited items list. This includes everything from the seemingly innocuous (wine bottles) to the obviously dangerous (crossbows). However, some items appear more frequently than others, and analysis of the data showed that while gamers got quite efficient at identifying the more usual threats, the identification rates plummeted when it came to tagging the ultra-rare-items. This has obvious implications for the industry on which the game is based. We’re always reading about how people try to sneak totally insane things through airport security, but how often does each screener have to I.D. an explosive cannonball? Not all that often, and if data from the game is any indicator, this represents a blind spot. The study is also interesting on another level. If you’re going to run tests based on rarity of items, then you need to show participants a massive number of images before you’ll have any real clue as to how they react to ultra-rarity. But thanks to the standard Apple User Agreement and some generosity on the part of the Kedlin Co., the research team was able to work with data from 20 million virtual suitcases generated from Airport Scanner—and that was just between December 2012 and March 2013. Over the last year, the team has gained access to 1.5 billion trials. Interestingly, this silly little video game may already be helping make our airports safer. Biggs and his colleagues work closely with the TSA and have conducted research to determine what kind of cognitive differences there might be between the searches of a trained professional and the kid killing time on his iPhone. On a personal note, I can tell you that after playing a few rounds of Airport Scanner, I will approach the slowly-moving security line with newfound patience—because that kind of pressure is enough to give a person an anxiety attack.